1,072 pages | 577 B/W Illus. 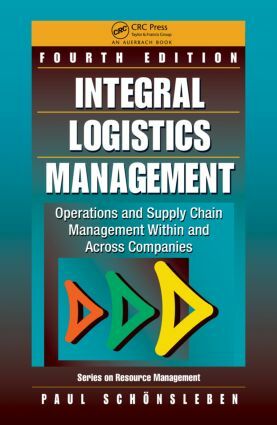 From the Foreword of theFirst Edition of Integral Logistics Management: Operations and Supply Chain Management Within and Across Companies: "Changes in the world outside the company alter the way that we look at problems and priorities in the company itself. This presents new challenges to company logistics and to planning & control of corresponding business processes." Written almost twelve years ago, these words are perhaps more true now than ever before. Incorporating the elements that made previous editions so popular with students and professors, the fourth edition reflects the expansion of the role of supply chain management to include all areas of industry and all objects in the product life cycle. Each chapter includes summaries, keywords, cases, and exercises. Definitions of key concepts and terms are boxed for emphasis and important principles, examples, points to remember, prescribed procedures, steps of a technique or solutions for selected scenarios and exercises are highlighted with a gray background. Additional interactive Macromedia Flash elements are made available for download from the book’s companion website. Magic formulas, catchwords, and simplifying theories do not stand much of a chance in logistics, operations and supply chain management. The complex reality of day-to-day operation of companies in industry and the service sector demands highly diligent detailed work. Covering all of the critical details in this area, the book equips students for tackling the logistics, planning, and managerial challenges they’ll most certainly have to face. Professor Paul Schonsleben studied mathematics and operations research at ETH Zurich. He obtained a PhD. degree in 1980. From 1983 to 1991, he was full time professor for Business Informatics at the University of Neuchatel, Switzerland. Since 1991 he has been full professor at ETH Zurich, chair of operations and supply chain management. He was dean, deputy head, and head of the Department BEPR and MTEC from 2001 to 2005. He is member of the Board of several companies and foundations.